Shaquille O'Neal went over the 25,000-point mark for his career midway through the first quarter against the New York Knicks on Monday night. O'Neal, who entered the contest five points shy, is the top scorer among active players and 14th overall in NBA history. The Miami Heat center is the seventh to reach 25,000 points and 10,000 rebounds. The 15-year NBA veteran is the first to hit the scoring milestone since Indiana's Reggie Miller on March 23, 2005. 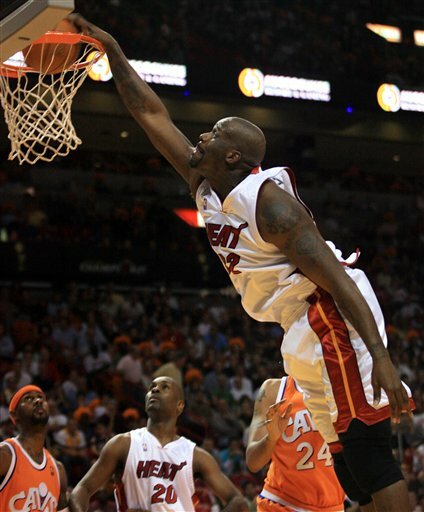 O'Neal, limited to just 17 of Miami's first 56 games this season because of a knee injury, came in with 11,193 rebounds. He joins Kareem Abdul-Jabbar, Karl Malone, Wilt Chamberlain, Moses Malone, Elvin Hayes, and Hakeem Olajuwon as those with 25,000 points and 10,000 rebounds. The Heat are counting on O'Neal to carry them down the stretch while leading scorer Dwyane Wade is sidelined because of a dislocated left shoulder. Miami went 18-21 without O'Neal this season. Wade is expected to join the team at the White House on Tuesday, when they are honored for winning last season's NBA championship, and then visit a doctor the following day to get another opinion on his shoulder.